The Londorossi Park Gate is located on the western side of Kilimanjaro. At the gate, you pick up our game ranger who will accompany the group, as you might encounter elephants and buffaloes during the trek. You drive to the trailhead at Lemosho Glades and start our trek through the rain forest. The vegetation is so untouched that it grows right across the narrow track. The flora and fauna are richer here than on the other more popular routes through the rain forest. Our trek today will be along a little used track known as Chamber's Route. In about 3-4 hours, you reach our camp in the rain forest at Mti Mkubwa (Big Tree). After breakfast, we start the climb cross the remaining rain forest toward the giant moorland zone. Day 2 is a full day trek with an altitude gain of 2,000 ft. We stop for a great lunch stop at one, a beautiful valley just outside the Shira Crater at around 10,000 ft. After lunch, we cross into the Shira Caldera, a high altitude desert plateau that is rarely visited. 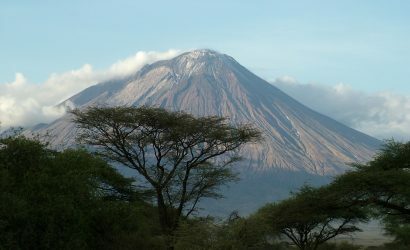 Shira is the third of Kilimanjaro volcanic cones, and is filled with lava flow from Kibo Peak. The crater rim has been decimated by weather and volcanic action. You will get your first close views of Kibo - the dramatic summit of Kilimanjaro. After breakfast, you continue hike east across the Shira Plateau past the Shira Cathedral toward Shira Two camp. You only gain 700 feet in elevation - this allows us to acclimatize slowly to the altitude. The views of the plateau are nothing less than spectacular. This is the last of the "easy days". It is about a 7-hour superb hike. You pass the Lava Tower, around the southern flank of Kibo, and slowly descend into the spectacular Barranco Valley, interspersed with giant lobelia and senecia plants. After arriving, everyone stands in awe at the foot of Kibo Peak, looming high above, on our left. The camp is only 465 feet higher than where we were last night, but during the day, you will have climbed to just over 14,000 feet. This is one of our most valuable days for acclimatization. On the eastern side of the valley, across the stream is the Barranco Wall - a 950 ft. barrier of volcanic rock. Although it is tall and looks steep, it is very easy to climb. This is our first challenge of the day. The views from the wall are magnificent. The rest of the day is spent skirting the base of Kibo peak over our left shoulder. You descend down into the Karanga Valley, where you rest up for the night before the tough climb up to Barafu hut. You will be making a steep hike out of the valley. The air starts getting quite thin, and you will be running short of breath. It is a tough, but rewarding uphill to the rocky, craggy slopes at the camp. Barafu means, ice in Swahili, and it is extremely cold at this altitude. Go to bed early because we will be waking you at midnight for the final leg to Uhuru Peak. You start climbing around midnight, on the steepest and most demanding part of the mountain. The moon, if out, will provide enough light, and we will reach the crater rim by sunrise, after a 7 hour hike, and welcome a new dawn. 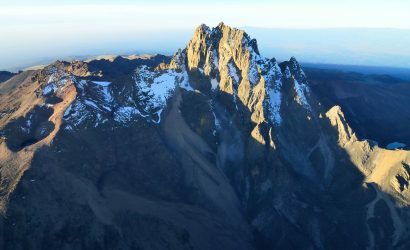 From the crater rim, rugged Mawenzi Peak is a thrilling sight, with the Kibo saddle still in darkness beneath you, and the crater's ice-walls looming ahead. You now continue to Uhuru Peak (1-2 hrs.) 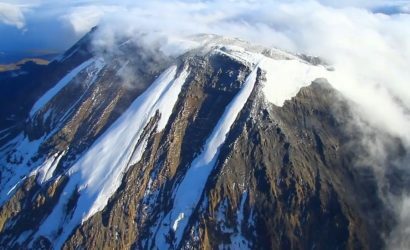 This is the highest point in Africa, and the world's highest solitary peak (19,340 ft). It is the best view in Africa! The descent is invigorating. It is a good idea to have a little rest once in awhile as you continue down back to Barafu camp (4 hours), and then down the Mweka route to Mweka camp (5 hours). This is where we spend our last night on the mountain. The next morning you have about 3 hour hike out. Our vehicle will drive you back to Arusha. Stay overnight at the Outpost Lodge on B/B basis.